Architecture of an Outfit: Lazy Day Essentials: How to Get Away With Not Shaving Your Legs » thereafterish. Architecture of an Outfit: Lazy Day Essentials: How to Get Away With Not Shaving Your Legs » thereafterish. Let’s face it, women are under pressure to always look good, either by society, media or even ourselves. And, in all honesty, it’s a lot of effing work, ain’t it? Who always has the energy to constantly have the perfectly coiffed and turned out hairstyle, flawless skin, glowing makeup and well-chosen clothes? And that’s just the surface stuff! What about the energy and time invested into the maintenance of it all? We have to treat our skin and aging concerns, tweeze those eyebrows, file and manicure those nails and shave those legs. Seriously, it’s a ton of work and, while it often has a great effect on our psyches, it can take a toll on us from the sheer amount of effort required. Sometimes you just want to cut corners! Vintage cropped acid wash denim jacket. Target Inc basic white tank. 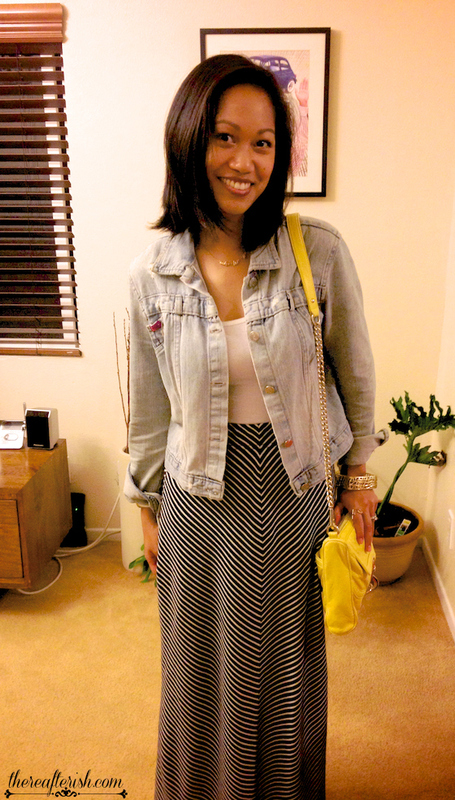 Forever21 nautical chevron print maxi skirt. Rebecca Minkoff MAC Mini bag (exact). JewelMint rings and birdcage bracelet. Marc by Marc Jacobs heart locket watch. JACKET: Distressed cropped denim jacket. 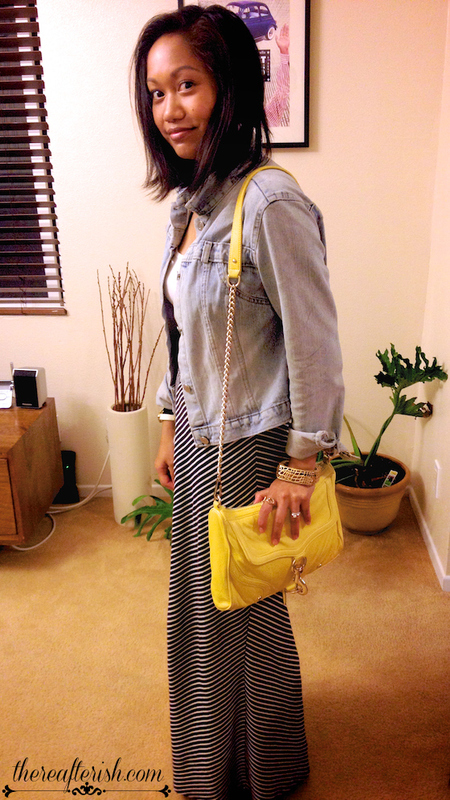 SKIRT: Chevron print maxi skirt, belted chevron maxi dress (LOVE THIS ONE), striped maxi tank dress. RING: XO stack ring, stackable initial ring. CUFF: silver cage cuff, gold cage bracelet. I’ll let you in on a little secret: I hate shaving my gams. I have a depilator, whose effects of hair removal can last for a good week to two weeks before hair regrowth, but the time to depilate is exponentially more consuming than a quick shave. But even shaving? I hate it. That extra 5-6 minutes in the shower is a lot of wasted water (even though I usually turn off the shower), time and energy trying to maintain my balance. This is why you will catch me in a maxi dress, maxi skirt or leggings more often than shorts and shorter skirts. This is my secret to cutting my beauty corners and shortening time spent in the bathroom. I don’t shave my legs unless I have a pair of shorts or skirt I’m dying to wear or my family and I are going to the beach. The rest of the time, you’ll find me in leggings, jeans, or a maxi dress or skirt! WHEW! That’s a huge load off my chest. So, next time, when you’re pressed for time and energy, and you just want to forgo one of those stupid steps to getting your perfection on, just get back to the basics and put on some jeans or a maxi with a fantastic print. You’ll be glad you just shaved by! HAH! accessoriesAccessory PornArchitecture of an OutfitAsian Street Style Fashionfashionforever 21Hawaii Street StyleOOTDoutfitOutfit of the Daystylethereafterish.